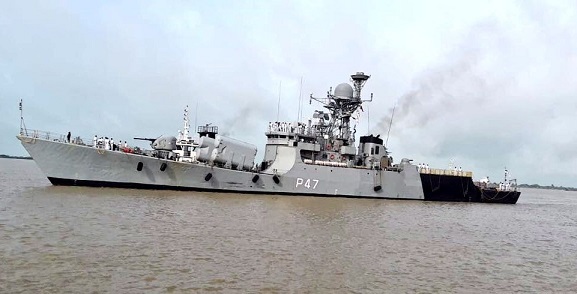 Indian Naval Ship Khanjar has called into Yangon in Myanmar on Saturday. It will be there in Myanmar from August 18-20 to further strengthen close and strong bilateral relations between the two countries. Khanjar was received by Myanmar Navy’s First Field Commander & Indian Embassy’s Naval Attache-at the Thilawa Terminal. INS Khanjar (P-47) is a Khukri-class Missile Corvette and was commissioned into the Indian Navy on 22 October, 1991. The ship has a displacement of 1350 tones, length of 91 meters and is capable of doing speeds in excess of 25 knots. It is equipped with various armaments, radars and sensors and is also designed to embark one helicopter. The ship was designed and built by M/s Garden Reach Shipbuilders and Engineers, Kolkata. INS Khanjar is part of the Eastern Fleet based at Visakhapatnam. The ship derives its name from a curved Indian dagger that is sharpened on both edges and has been used effectively by many able warriors in the past. The Commanding Officer of INS Khanjar is Cdr V Shirdikant who heads a crew of over 120 personnel, including officers and sailors. Major activities during stay in Yangon include courtesy calls, interaction with personnel from the Myanmar Navy and visit to places of interest including the famous Shwedegon Pagoda.